Seasonal celebrations begin with the FTD® Christmas Coziness™ Bouquet. This classic assortment of fresh holiday greenery, includes variegated holly with red berries, natural pinecones and cinnamon sticks – an invitation to the scents, scenery and style of traditional holidays. 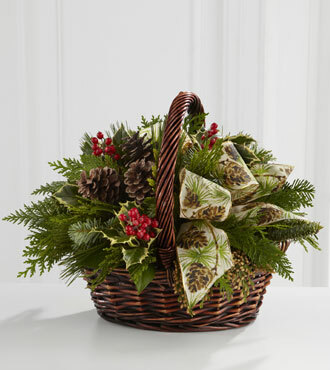 Adorned with ribbon, this cozy wicker basket has a handle, so it easily goes from hearth to table. With your personal card message included, this easy care bouquet is a favorite for the office and a welcome seasonal gift for friends and family.